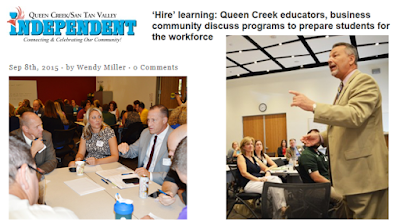 Here's a great story by Queen Creek/San Tan Valley Independent reporter Wendy Miller about the Queen Creek Chamber of Commerce education summit hosted at the Communiversity at Queen Creek on Sept. 3. Among the things discussed was how to prepare students for the workforce. Pictured in photo to right, standing, is Communiversity at Queen Creek Director of Community Partnerships Charles Flanagan leading one of the discussions. "By working collaboratively, educators and businesspeople can create a sustainable workforce of young adults who will continue to live, work and raise their family in Queen Creek," said Flanagan.